Windmill Hill Windmill is the largest and second tallest post mill in the UK, standing at 15.5m. 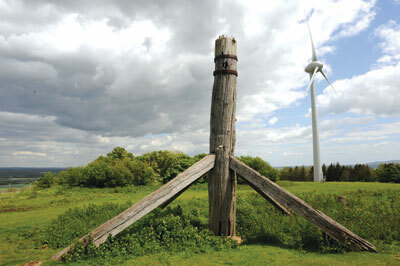 A post mill is a windmill which sits atop a sturdy post, upon which the entire body rotates in order to face the wind. The oldest type of windmill, it originates in the 12th century; later variants include the tower mill - a 14th-century brick built design on which only the top part rotates - and the smock mill, so named for its sloping weatherboarded tower which resembles a miller's smock. Originally built in 1814, its first big change came in the mid-19th century. 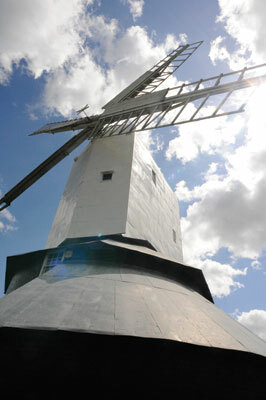 A large house was built nearby which mill owner Edward Beeny claimed quite literally 'took the wind out of his sails'. After legal action failed, he was forced to raise the mill, brick by brick, an extra storey in height; a drastic but effective solution which lifted the sweeps to a height where they could once again catch the wind. 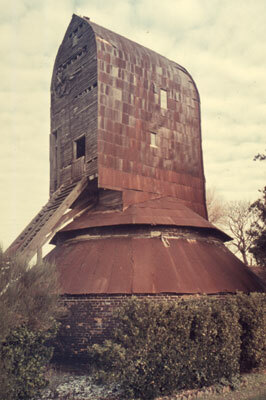 By the 1890s the structure of the windmill's 'buck' - the timber housing on top of the mill - had become unfit to take the forces involved in wind power. Some machinery and the sweeps were sold and the mill was converted to steam power, on which it ran until 1913 when it ceased working, and was derelict for many years afterwards. 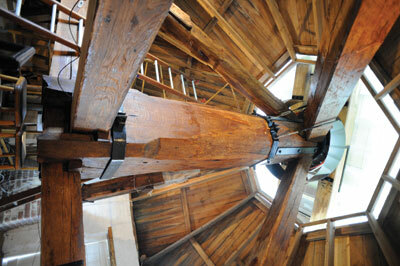 In 1987, although the mill seemed on the verge of collapse, it miraculously survived the October hurricane. 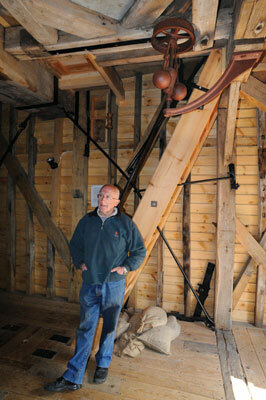 In 1993, the mill was put into an auction, where Bee and Paul Frost bought it, determined to see it revived. 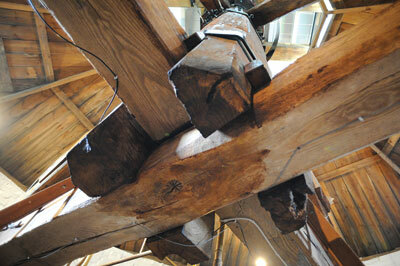 Years of rainfall entering the mill had rotted the timber framework from the top down; the largest timbers had broken in half, causing the structure to sag, resting on the roof of the roundhouse below. As a temporary measure, a supporting steel frame had been installed to prevent an imminent collapse. The Frosts set up the Windmill Hill Windmill Trust in 1996, and applied to the Heritage Lottery Fund for a grant to fund its restoration. 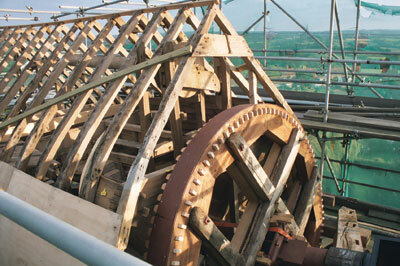 Five years later, after a detailed evaluation funded by English Heritage and the local council, the Fund awarded a grant of Â£577,000 towards the Â£770,000 needed for the structural restoration; the largest grant that had ever been awarded in the UK for the restoration of a single windmill. To raise the remaining funds, The Trustees secured further grants from a number of foundations and trusts and carried out fundraising events. By 2003, the full amount required had been raised. In order to make the necessary repairs, the mill had to be completely dismantled - but first every single stud, floor joist and raft had to be numbered for its eventual reassembly, a task you can imagine took patience. 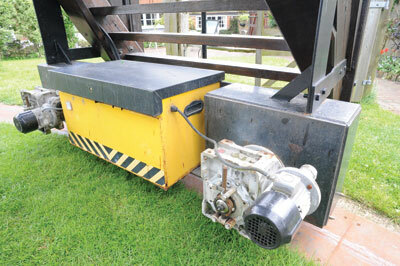 A 65-ton crane was brought in to remove the mill bit-by-bit, to be transported to IJP Building Conservation in Oxfordshire, leaving just the roundhouse and scaffold-surrounded post on site. Michael Chapman is a retired engineer who received an invitation from Bee Frost to help with the mill after his time involved in the restoration of the Stone Cross Windmill in nearby Pevensey. 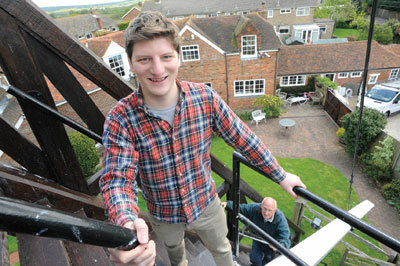 He has been involved with Windmill Hill since 2006, and is now part of the project to restore the mill's machinery, as the initial restoration was purely structural; it is still not a working mill. As an engineer, Michael has a passion for making things work, but Â£89,000 is needed before the inside can be equipped and the sweepsâ€™ shutters installed. There is, however, still plenty to interest us as we look around the building. Two horizontal crosstrees appear at first to support the post at their intersection, but in fact they don't take the weight. 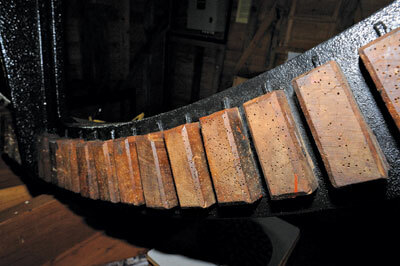 Each end rests on one of four brick piers, and four sloping quarter-bars are jointed to the ends with an unmovable, double-stepped birdsmouth joint, with brackets further solidifying the link. Each quarter-bar is tenoned into the post just before it reaches the next floor, and acting by compression they transfer the weight of the mill from the post to the ends of the crosstrees, and thus to the brick piers. Extreme winds will test the strength of these tenons, so they have to be exceptionally secure. I was puzzled by wires that passed along the quarter-bars, linking to an unusual device attached to each. Michael explained these are amplifiers which link to a central strain recording system. This has been running for two years in conjunction with Newcastle University; research students analyse the data and thus determine the future safety of the structure. This information is passed on to other molinologists - 'molinology' being the study of mills - and is a completely unique study, as strain gauging has never been implemented in this way before. 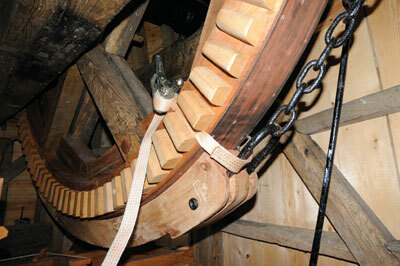 Traditionally, the mill would have been rotated by hand; the miller would turn the entire 33 tons by its tailpole! Millers typically worked alone in their mills. 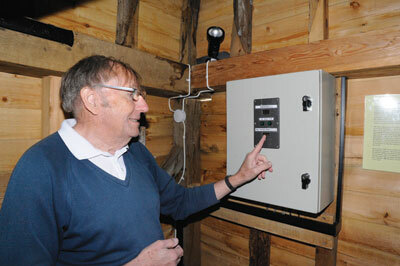 An innovative new aspect of the restored mill is its automatic turning device. Instruments on the roof gauge the direction and speed of the wind, and then pass the data on to a mini computer inside the mill, which sends instruction to the motor at the base of the ladder, powered by two lorry batteries. The ladder moves along a circular track to rotate the mill, which makes turning the sweeps into the wind much easier and keeps the structure safe as the buck is 'faired' at the front end to take the wind. Incidentally a windmill buck is meant to lean forward so that when the wind blows it will straighten upright. 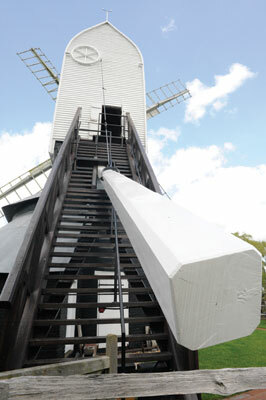 Also unique to Windmill Hill is its sweep governor, which was patented by Charles Hammond who owned the mill during the 1870s, and is the only example remaining. "You want everything to be constant", Michael explains, "but it's just not possible. 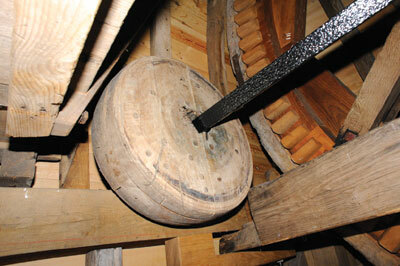 When there's a gust of wind, the sweeps' shutters open automatically; to counter the change in speed, a weight on this chain is lifted, which pulls the millstones back together, so the quality of the grinding doesn't decrease. 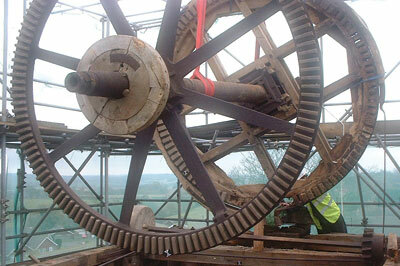 One of the most exciting things about getting the mill working again will be seeing how well Hammond's governor works." My thanks to Michael Chapman, Bee Frost and Rhys Clatworthy for your time and wonderfully thorough guided tour. The next stage of the restoration is to return the mill to full working order, and as well as the money to be raised, Michael tells me that there is a need for more practical volunteers to help with the project. 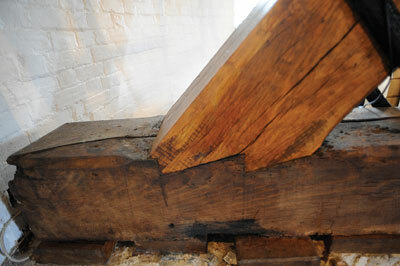 If you would like to join in with this valuable restoration work, please contact the Trust.